We're inviting YOU to our special fundraising event, Pints for Parkinson's, this Saturday, September 8th at 7 Locks Brewing in Rockville! Join us for an afternoon filled with good beer, food, and lots of fun! 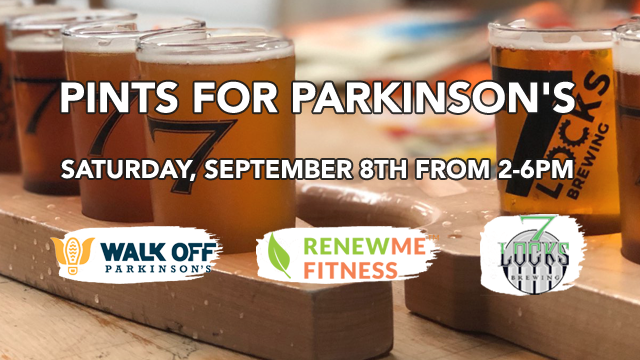 RenewMe Fitness and 7 Locks Brewing are partnering to help raise funds for the Parkinson's Foundation of the National Capital Area (PFNCA), so they can continue to improve the quality of life for people impacted by Parkinson’s Disease. Feel free to bring your kids! 7 Locks Brewing is a very kid (and baby) friendly space. We will have lawn games, board games, and other activities for people of all ages! Simply click the button below to register. If you cannot attend but would still like to support our Parkinson's relief efforts, you may also click the button below to make a tax-deductible donation. If you missed out on our August Promo for our Small Group Training, you haven't missed out completely! We are always adding more sessions to the calendar, so get in touch now and we can get the process started again! We are here to help you age on your own terms! "I have been working with RenewMe Fitness for the past three years following a serious illness that left me temporarily paralyzed from the neck down. It took a full year to relearn how to walk. The approach to training with Peter and RenewMe Fitness has been focused on recovering strength, stamina and balance so that I could return to doing the things that I enjoyed so much before my illness. I could not be more pleased. I am back to traveling internationally for both work and pleasure; hiking in the Rocky Mountains and the Italian Alps; playing with my grandchildren; cooking and entertaining for large family groups; and thoroughly enjoying high energy levels and staying physically active. I cannot emphasize enough how important the weekly training sessions have been to my full recovery and I would strongly recommend the team at RenewMe to others." We'd love to hear from you. Contact us anytime!